We've all heard that electrolytes are important. But, which are we not getting enough of? Well, let's take a look. There's 7 total: Sodium, Chloride, Calcium, Potassium, Magnesium, Phosphate and Bicarbonate. Bicarbonate is produced by the body. Sodium and Chloride is found in salt, something we get more then enough of. Phosphorous is found quite abundantly in fruits, vegetables with more then enough of it in meats. Calcium is also present in most fruits and vegetables. WHO's target calcium of 500mg is easily reached with fruits and vegetables. Most milks are fortified with calcium, some of which may be 40% - 80% per cup, making it very easy to exceed the calcium requirements. Labels in the US, use the USDA's more aggressive recommendation of 1000 to 1200mg of Calcium, so the percentage will appear about half that. So, that leaves potassium and magnesium, which most people don't get enough of. The following table shows which foods have the highest potassium and magnesium densities. As usual, it's normalized to 200 calories, so anything above 10% should be considered a high source. The class leaders here are greens like Spinach, Kale, Collard greens, etc. Before you wip out the pot boiler, keep in mind, that when you boil these greens, you can loose some vitamins and potassium, so don't boil them any longer then you have too. Minerals, like magnesium, are generally safe. 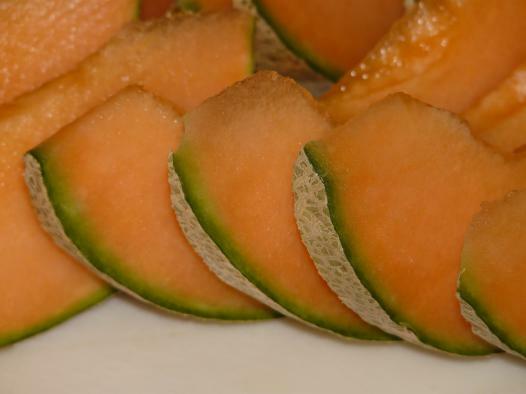 Below: 1/6th of a Cantaloupe, about 30 calories and 6.7% of your daily potassium needs. The greens require some preparation. So, if you want a quick and easy boost of potassium, you can go with just a couple of tomatoes (45% of daily value in 200 cals) or cantaloupe (72% of daily value in 200 cals). And, since you can eat them raw, you'll be getting the full nutritional value! Also relatively high in the fruit category: Strawberries, watermelon, kiwis, bananas, blackberries, and apricots. And, if you want to see how these foods rank against other foods, check out our nutritional density calculator. Kale.World is all about nutritional density – all our findings are normalized on a per calorie basis, making it easier to compare various foods.